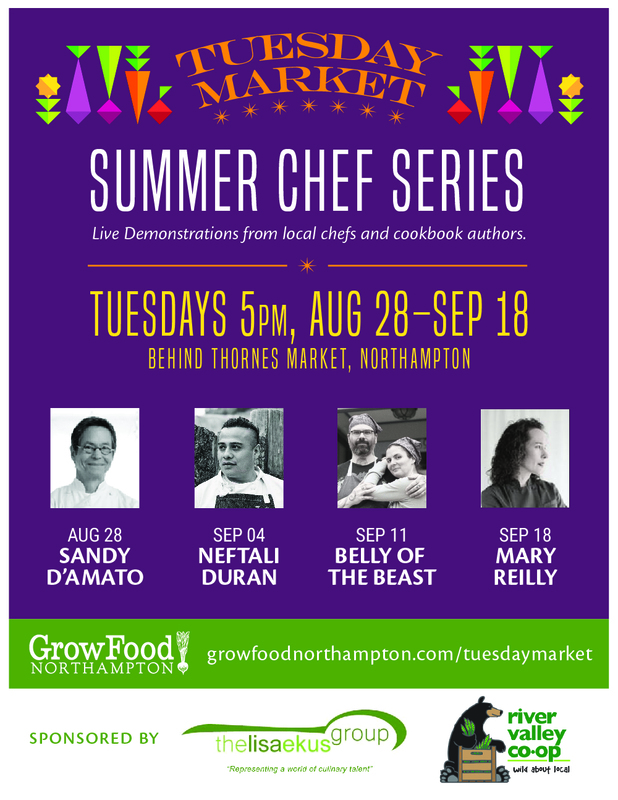 The Summer Chef Series is back again at Tuesday Market! 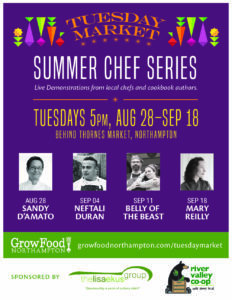 For four weeks, starting on August 28, market-goers can enjoy an educational cooking demonstration at 5pm each week at the market. 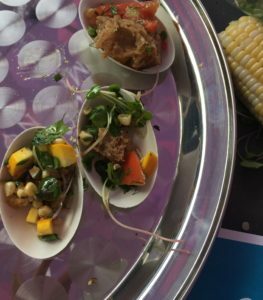 After each demonstration, the guest chef will be available to answer questions and offer samples of their dish, prepared with ingredients from around the market. We’re happy to be working with local literary agency The Lisa Ekus Group again this year on planning the series. Lisa’s team helped us to select this year’s impressive line-up of talent. The first week will kick off with James Beard Award winner and well-known chef and educator, Sandy D’Amato. Sandy has had an impressive career including a long-running and highly regarded restaurant in Milwaukee, many awards and recognitions and a friendship and professional relationship with Julia Child. Sandy relocated to the Valley in 2014 to open Good Stock Farm Cooking School which is now regarded as one of the top 10 cooking schools in the world! Week Two will feature Valley food celeb, Neftali Duran. Neftali has held many titles in his life: chef, restaurateur, food justice advocate, activist, educator. Longtime locals fondly remember his El Jardin bread. Week Three we welcome the owners of Belly of the Beast, Aimee Francaes and Jesse Hassinger. Aimee and Jesse have had long careers in the food world before opening Belly of the Beast on Main Street in Northampton in 2017. Our final week of the Chef Series on September will feature the return of Mary Reilly to Tuesday Market! Mary kicked off our series last year with her Pioneer Valley Panzanella recipe. Mary is the Publisher of Edible Pioneer Valley and Executive Chef at Westfield State University. This fun, educational and delicious series is made strong by our collaboration with The Lisa Ekus Group, financial support from RiverValley Coop and audio assistance from Mill River Music and Guitar. We are very thankful for this help. Tuesday Market Is On Until November 11th! This is it! Last market of the season! previous post: Tuesday Market- August 21, 2018!